Last week Facebook sent out an invitation to the press to “Come See What We Are Building.” The invitation gave no clues as to what the press would be coming to see only when and where to be to see it. 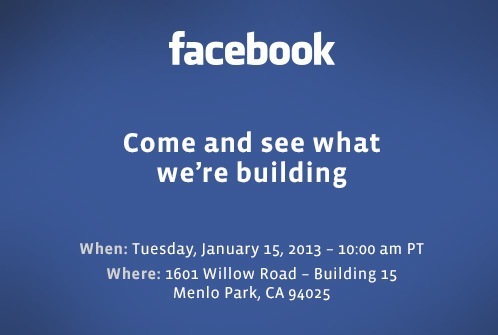 The event is scheduled for tomorrow, and speculations have been running wild about what Facebook could be announcing. The top rumor going around online is that it’s a new Facebook phone. This is in spite of how vehemently Mark Zuckerberg, Facebook CEO, has denied that there was anything of the sort in the works. Of course, that is probably the reason why people are still talking about it. Mr. Zuckerberg seems to object a little too strongly to that notion. Bear in mind that Facebook is a company of hackers in love with code. They are software geeks not hardware guys. Why limit themselves to one mobile device when they already have their code living, posting, tracking on every smartphone, tablet, and computer on the market? Search may be coming to Facebook. It has been a topic that Zuckerberg has been very excited to talk about recently. But don’t expect the first incarnation to be something to rival Google just yet. 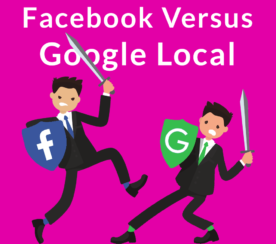 More likely it will just be better search options within Facebook. That would at least be consistent with recent updates to privacy settings. A full roll out of a redesign to Timeline could be a possibility. They have been testing a new design for several months, and it would certainly be a change significant enough to make a big announcement. One idea from TechCrunch writer, Josh Constine, is that maybe they are going to revamp notes to take on Tumblr. This may be wishful thinking on Constine’s part, but it would have my vote. One of the things I loved about MySpace back in the days before Facebook ate it alive was the blogging feature within the account. Facebook has never had a decent option for publishing. But I would contend that this is a feature that users would love, but not the kind of thing that businesses need. Smart content strategy for anyone with a website is to keep your great content on your own site and share the link to your Facebook network. Tomorrow will tell the tale, but we can dream a little longer while we wait. What would you like to see Facebook change, update, or add? Should You Let Google Index Syndicated Content & Press Releases?